We invite you to visit Malaika Early Learning Center to see our children learning and growing in our beautiful facility. Seeing the staff and kids working together is inspiring! To arrange a visit, please contact Executive Director Tamara Johnson at 414-562-4997. Malaika earns 80% of the funds we need through the School Choice, Head Start, and W-2 programs, but the remaining 20% must come from donations. All donations are tax-deductible and every contribution helps! Please click here to donate online. The best times to volunteer are from 8:00-noon and 1:30-3:30 p.m. For more information, you may submit the form below or contact Executive Director Tamara Johnson at 414-562-4997. I’d like to learn more about volunteering at Malaika. Please contact me. 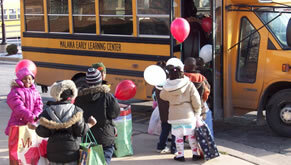 Thank you so much for your interest in Malaika Early Learning Center! Motivated and caring staff members.